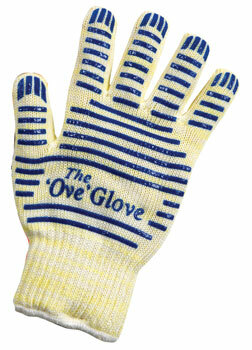 Ove' Glove: five-finger, oven protection. This glove is flexible which makes it perfect for getting hot dishes out of the oven, AND it has a gripping feature so dishes won't slide from your grip! Speaking of baking, the Cool Touch Oven Rack Guard is a nifty invention. Snap it on the front of your oven rack and no more arm burns! That's a great idea for everyone! 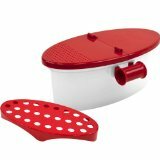 Microwave Pasta Boat - I LOVE THIS PRODUCT! Pasta cooking has never been so easy. 1. Measure the pasta by inserting pasta into the round tube handle (one handle full = two servings). 2. Place the pasta in the boat. 3. Add water to the line (NOTE: The water line is very light so you may have to have someone mark the water line on the outside of the boat.). 4. Put the boat in the microwave and cook until done. No stirring, no watching, and no stuck-up noodles either! The pasta comes out perfect every time once you figure out the cooking time needed. It depends on pasta type and the watts of your microwave oven. I cook angel hair pasta for 10 minutes with an 1100-watt microwave. It's SO EASY and yummy!